A classy looking renewal of the Grade 2 Peterborough Chase over an extended 2½ miles at Huntingdon saw the Nick Williams trained Gauvain upset the odds winning the race by a good five lengths from hot 5/4 favourite, Somersby. The 15/2 shot Gauvain, was given the opportunity to run in the race following his tumble at the eighth fence in the Grade One, Tingle Creek Chase last weekend which clearly did not affect his confidence. The nine year old, who has an official rating of 159, always travelled well and was virtually error free over the 16 fences. He was pushed into the front by jockey Noel Fehily three fences from home and immediately stole a march on his rivals taking an eight length lead by the time they had taken the second last. Somersby, who was disappointing, did try to catch the leader, but clearly jockey, Dominic Elsworth had left it far too late and although he narrowed the gap after the last, Gauvain still ran out a ready winner by four lengths. Trainer Henrietta Knight, who has saddled the winner of this race, eight times previously had high hopes for Somersby this season. 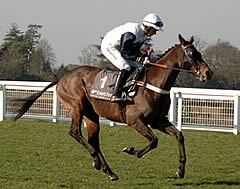 A good performance in this race then it was on the cards that he would go to Kempton Park on Boxing Day to take on Long Run, Kauto Star and Master Minded in the King George Chase. However, in light of this under par performance, it has become uncertain exactly what the plan for him will be. It is possible of course that he will strip fitter for this run and will still be amongst the starters at Kempton on Boxing Day for which he is currently a 10/1 shot in the King George Odds. As far as Gauvain is concerned, Williams has suggested that his target at the Cheltenham Festival will be the Ryanair Chase but he will have at least one more run before then. He has always been regarded as a decent horse capable of winning big races, but he has always found at least one better in any of the Grade One races he has entered in the past. The Peterborough Chase this year was not helped by the early fall of the Paul Nicholls entry, The Nightingale, who came down at the fifth. In fact with 167 he was the highest rated horse in the race, but setbacks have curtailed much of his career and it looks like Nicholls will have to go back to the ‘drawing board’ with him once again. The two novices, Mr Moonshine trained by Sue Smith and Hidden Keel from the Charlie Longsdon yard both ran encouraging races, finishing third and fourth respectively and look set to be winning again soon. Indeed, Mr Moonshine has already won two novice chases this season and could be heading for the RSA Chase at Cheltenham in March.